Carry out nutrient management planning on an annual basis. Consider the availability of nutrients from all sources (eg. Livestock manures, commercial fertilizers and atmospheric nitrogen fixed by legumes). Apply nutrients to meet crop requirements while accounting for the nutrients already in the soil. Calibrate application equipment to deliver target rates. Respect recommendated setback distances for nutrient application near waterways. Place nutrients below the soil surface where they can be taken up by growing roots when needed. 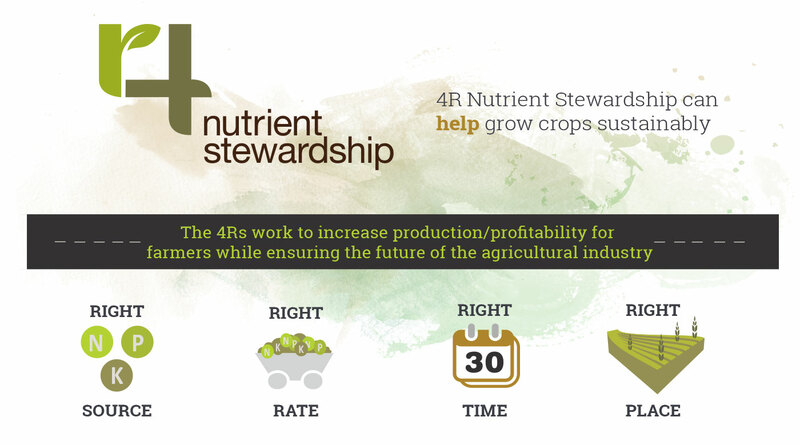 What is the 4R Nutrient Stewardship? 4R Nutrient Stewardship (Right Source at the Right Rate and the Right Time in the Right place) lets the world know when food has been sustainably grown. Sustainable farming is the future. Start implementing 4R nutrient Stewardship, and record your progress online to demonstrate how we are leaders in sustainable agriculture. Optimizing nutrient managment is simply good business in dealing with fluctuations in prices of fertilizer and other inputs, as well as in process of crops sold. Adopting nutrient stewardship contributes to the preservation of natural exosystems by growing more on less land. Retaining nutrients within a field's boundaries and in the crop rooting zone greatly reduces the amount that i snot utilized by plants and thereby escapes into the environement as pollution.